Dependent on your chosen delivery mode. Enquire now to find out more. Studying with AIPT means you’ll graduate industry-ready. Looking to take your fitness career to the next level? Expand your skillset and gain the right qualifications to work as a registered personal trainer with this online SIS40215 Certificate IV in Fitness course. Delivered by Australia’s leading provider in practical fitness education, the Australian Institute of Personal Trainers, this program is designed to broaden your skills and qualify you to work with a larger range of clients. The program will show you how to tailor exercise programs for children, adolescents and older clients; and covers a variety of core skills that will set you up for a long-term career in this dynamic industry. You will learn about training legalities, the specifics behind fitness planning, motivational psychology and what it takes to plan and run your own fitness business. 52 hours face-to-face practical delivered on-campus with theory components completed online in your own time. 40 hours of face-to-face practical completed with an AIPT Mentor, a qualified Personal Trainer, who will guide you through your course material and provide you with hands-on experience, with theory components completed online, in your own time. Choose your own Mentor* to guide you through 40 hours of face-to-face practical. Theory components are completed online, in your own time. *Your mentor must be approved by the Australian Institute of Personal Trainers. 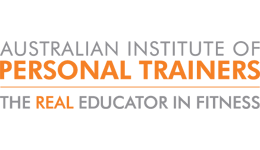 The Australian Institute of Personal Trainers has partnered with a number of gyms to not only offer you the highest calibre of training but also to offer you a Graduate Placement Guarantee+. This Graduate Placement Guarantee applies to all those who study the Complete Personal Trainer at a Goodlife Health Club, Genesis Fitness Club, Core24 Health Club or Club Lime location. When you graduate from this Australian Institute of Personal Trainers qualification, you will be certified to the standards required by Goodlife, Genesis, Core24 or Club Lime and you will be given the opportunity to work as a fitness professional in one of these leading gym network partners within six months of graduation. ^The Complete Personal Trainer Program consists of the SIS40215 Certificate IV in Fitness + Entry Requirements. Please contact us for further details on the course structure. ~Terms and conditions apply to the Graduate Placement Guarantee. Enquire now for more information. Studying with AIPT means you'll graduate industry-ready. SIS40215 Certificate IV in Fitness has a mandatory pre-requisites of holding a valid First Aid Certificate (HLTAID003 Provide first aid) before commencement. This qualification needs to be completed through an external third party, and the cost of this external training is not included in any of your course fees. The Australian Institute of Personal Trainers has an agreement in place with Red Cross Australia (RTO 3605) which provides First aid Training to AIPT students at a reduced price. Red Cross Australia is an independent third party training provider. AIPT acknowledges this is not the only Third Party Provider able to deliver accredited First Aid Training and students are encouraged to find the right provider for them. Upon successful completion of this course, you will receive a nationally recognised SIS40215 Certificate IV in Fitness from the Australian Institute of Personal Trainers. The Australian Institute of Personal Trainers (AIPT) offers affordable payment options to help you start your studies sooner. Tuition fees include course delivery and assessment, study materials and dedicated student support services. Please note this course does not qualify for VET FEE Help or other assisted government funding.